Today in history, September 8, 1966, a show destined to become one of popular culture's most important and influential debuted on the US's NBC network. The original concept behind the show, by creator Gene Roddenberry, was to produce a Western in outer space - "Wagon Train to the stars," he said. But there was much more to the show than that. Unbeknown to even the TV execs who commissioned it, Roddenberry intended to create one of the most radical shows of the 1960s. Therein lay the genius of Star Trek. By donning his characters in futuristic uniforms and setting their adventures in space, Roddenberry could produce a TV show which reflected the highly-progressive political agendas of the 1960s counter-culture and youth movements. Roddenberry's vision may have "got by the network", but much of it was hard-won. For instance, NBC's concerns over marketability stood in the way of his desire for a racially diverse cast as crew of the Enterprise. Meanwhile, the show's stories and characters were used to explore what mankind might develop into, if only it would learn from the past. Take, for instance, the show's Vulcan aliens - a formerly-violent race who learned to control their emotions. Although the original series of Star Trek was cancelled after just three seasons, network re-runs and a solid fan-base led to a film series and spin-offs - later evolving in the multi-media Star Trek franchise so prominent in popular culture today. What's more, Star Trek's influence has stretched beyond multi-media. One of the show's most significant landmarks was American TV's first interracial kiss between Captain Kirk and African-American officer Lt Uhura. And, aside from the socio-political aspects, Star Trek also anticipated many current technologies - among them the Tablet PC, the PDA, mobile phones, and even the MRI scanner's found in today's hospitals. NASA even named its prototype space shuttle Enterprise after the fictional spaceship. The influence of, and concepts behind, the original Star Trek have built a solid and enduring legacy. As a result, Star Trek memorabilia items are among the most investible and collectible on the today's markets. So, to mark the anniversary of Star Trek's debut on US television, here we pick out three of the show's best memorabilia items sold in recent months. A Star Trek film series Starfleet Officer's uniform with jacket and shirt, auctioned by Heritage in July, emerged as the sale's second-highest lot - all worn by Shatner as Captain (or Admiral as he was in the films) James T Kirk in the popular sci-fi franchise. When Star Trek creator Gene Roddenberry created the original Star Trek series, he was keen to avoid "excessive militarism" in the costume designs. This was modified by director Nicholas Meyer for the second Star Trek movie, 1982's the Wrath of Khan. Meyer upped the Naval themes in both the actors' dialogue and uniforms. Designed by Robert Fletcher, actor William Shatner wore the uniform as Admiral James T Kirk in the films. It was later modified an worn by actor Leon Russom as a fellow Starfleet Commander in Star Trek VI. Inspiring enthusiastic bidding from Trekkies and collectors with an eye for a good investment alike, the costume commanded a final price of $44,812.50 including Buyer's Premium. Earlier this year, collectors had a chance to go boldly where no collectors have gone before at Propworx/CBS's online auction of props from the original Star Trek series. Highlights included a prop "computer screen" from the bridge of the original 1960s Enterprise. Bringing in bids from around the world, it eventually sold for $14,000 (you can see the screen in the original series episode, Errand of Mercy). And, of course, no Star Trek auction would be complete without an appearance from Mr Spock - or rather, his most recognisable attributes. An original pair of the Vulcan science officer's pointy ears, worn by Leonard Nimoy himself, sold for $3,000. And Ben Stiller also owns a pair, apparently. It's most recognised as the creepy bug-eyed alien which appeared in the closing credits of Star Trek: The Original Series' each week. 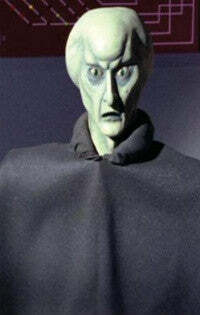 But this "Balok" puppet head first appeared in the classic first season episode, The Corbomite Maneuvre, terrifying the crew of the Enterprise. The 16-inches-tall polyurethane foam head was designed by legendary sculptor/artist Wah Ming Chang. His other Star Trek creations included the crew's iconic communicators, whose designs later inspired modern flip-type cell phones. Three electrical wires protrude from the alien's neck, presumably to control its eye movements, with a cable to move its mouth. The head had seen better days when it auctioned in California, last June, but still offered bidding fans a perfect opportunity to scare their friends. Estimated at $20,000-30,000, the head remains one of Star Trek's most popular symbols and did much to popularise the way people imagine aliens with its small chip and almond-shaped eyes. It was even honoured with its own brief parody in The Simpsons.